The Best Intellectual Property blogs from thousands of top Intellectual Property blogs in our index using search and social metrics. Data will be refreshed once a week. 2.56 PHOSITA - Dunlap Codding | You get the idea. Intellectual Property newsletter is a comprehensive summary of the day's most important blog posts and news articles from the best Intellectual Property websites on the web, and delivered to your email inbox each morning. To subscribe, simply provide us with your email address. Leesburg, VA About Blog IPWatchdog.com focus is on the business, policy and substance of patents and other forms of intellectual property, such as copyrights and trademarks. Today IPWatchdog is recognized as one of the leading sources for news and information in the patent and innovation industries. Facebook fans 4,405. Twitter followers 14,350. Columbia Missouri About Blog The nation's leading patent law blog. Facebook fans 33. Twitter followers 14,053. Cologne, Germany About Blog IP Newsflash features current news headlines related to patents, trademarks and other intellectual property issues. Facebook fans 1,183. Twitter followers 11,133. New York About Blog Law360 blog shares legal news and analysis on patents, trademarks, copyrights, trade secrets. Covers lawsuits, enforcement, ANDAs, Section 301, USPTO, legislation, regulation. Facebook fans 2,181. Twitter followers 30,260. Switzerland About Blog Intellectual Property Watch is a non-profit independent news service reporting on international IP policymaking. The leading international news service on global policymaking, trends & debates on IP, innovation & creativity. Facebook fans 9,013. Twitter followers 26,563. London-Hong Kong-Washington DC About Blog IAM is a bi-monthly magazine and online service that treats IP as a business asset and tool rather than simply as a legal right. Facebook fans 846. Twitter followers 6,077. Facebook fans 3,956. Twitter followers 7,967. India About Blog Founded in 2005 by Prof. Shamnad Basheer, an IP academic and consultant. SpicyIP is one of India's leading blogs/repositories on intellectual property (IP) and innovation law/policy. Through its independent reporting/analysis, SpicyIP is committed to fostering transparency within the Indian IP ecosystem. Facebook fans 2,772. Twitter followers 3,712. Geneva, Switzerland About Blog The World Intellectual Property Organization (WIPO) is the global forum for intellectual property services, policy, information and cooperation. Facebook fans 47,351. Twitter followers 55,168. London - Hong Kong About Blog WTR is a bi-monthly magazine and daily email news service that focuses on the issues that matter to trademark professionals. Facebook fans 1,265. Twitter followers 11,699. London About Blog The IPKat blog reports on copyright, patent, trade mark, info-tech and privacy/confidentiality issues from a mainly UK and European perspective. Facebook fans n/a. Twitter followers 17,293. Geneva, Switzerland About Blog The bimonthly WIPO Magazine aims to inform readers about WIPO-led activities, and to show intellectual property, creativity and innovation at work across the world. Facebook fans 46,299. Twitter followers 53,481. Global About Blog TrademarkNow provides an intelligent web-based trademark management platform that is used by enterprise companies, law firms and branding agencies for instant trademark search results and risk analysis. Facebook fans 333. Twitter followers 2,352. London, England About Blog Managing Intellectual Property magazine gives you all of the latest news, insight and commentary on the top stories affecting the world of IP law. Facebook fans 2,703. Twitter followers 24,333. Chicago, IL About Blog Patent Docs is a weblog authored by patent practitioners, which focuses on biotech/pharma patent law, including reports on changes in USPTO rules and procedures, recent court decisions, newly filed patent litigation, and recently issued patents. Facebook fans 213. Twitter followers 1,360. UK About Blog The Intellectual Property Office (IPO) is the official UK government body responsible for intellectual property (IP) rights including patents, designs, trade marks and copyright. Facebook fans 215,860. Twitter followers 1,579,726. Facebook fans 100,020. Twitter followers 72,998. About Blog Follow latest news and analysis on Intellectual Property. Fresh updates daily via JD Supra. D Supra is a daily source of legal intelligence on all topics business and personal, distributing news, commentary & analysis from leading lawyers & law firms. Facebook fans 7,158. Twitter followers 20,759. Europe About Blog Fieldfisher blog is all about Intellectual Property rights. Fieldfisher is a European law firm with market leading practices in many of the world's most dynamic sectors. Facebook fans 378. Twitter followers 4,367. NY About Blog Get insights that drive innovation with powerful intellectual property tools and intuitive semantic search software. Facebook fans 641. Twitter followers 5,234. About Blog Blog about counterfeiting, brand abuse and copyright on the internet. Here you will find industry insights and the latest anti-piracy and anti-counterfeiting techniques, created by the most technologically-advanced brand protection service online. Facebook fans 557. Twitter followers 2,175. India About Blog LegalWiz.in is an online portal that provides CA/CS & other legal business professional services specializing in company registration, trademark filing, GST registration, GST return filing and compliance. Call now and get expert advice from our CA / CS. Facebook fans 1,743. Twitter followers 135. Jersey About Blog CPA Global is the world’s leading Intellectual Property (IP) management and technology company. Their powerful integrated platform of IP software and services, power and manage the valuable ideas of some of the world's biggest, most innovative and disruptive companies. Facebook fans 226. Twitter followers 4,042. San Jose, CA About Blog NEWS UNIFIED INSIGHTSUnified Patents, Inc. was formed to address the NPE litigation problem that is plaguing both large and small operating companies in various technology sectors. Unified Patents employs a unique, multi-faceted NPE-deterrent solution. Facebook fans 488. Twitter followers 9,083. India About Blog India's leading source of information about Intellectual Property, including the latest news, announcements and opinions. Facebook fans 921. Twitter followers 2,846. Luxembourg About Blog Dennemeyer Group, originally founded as a patent law firm in Luxembourg, has been setting benchmarks for all services and software solutions in the IP sector for over 50 years. Dennemeyer evolved very rapidly into a global full-service provider for the protection and management of intellectual property rights. Facebook fans 879. Twitter followers 590. About Blog This blog covers software patent news and issues with a particular focus on wireless, mobile devices (smartphones, tablet computers). Facebook fans n/a. Twitter followers 14,263. Singapore About Blog Learn patent strategies from the best people of the industry and stay at the top of your business. Facebook fans 1,617. Twitter followers 1,379. New Jersey / New York About Blog Welcome to Scarinci Hollenbeck here you will find the latest on Intellectual Property. Scarinci Hollenbeck is a regional general practice business law firm with over fifty attorneys and offices in New Jersey, New York and Washington, D.C.
Facebook fans 2,041. Twitter followers 11,285. Bengaluru, India About Blog Intepat IP Services Pvt Ltd (“Intepat”) is a niche Intellectual Property (IP) services Company that provides a broad range of customized services in Intellectual Property matters, that includes patents, trademarks and design. Facebook fans 1,027. Twitter followers 3,383.
in the public domain About Blog The International Association On the Digital Public Domain. Facebook fans 9,042. Twitter followers 1,962. About Blog The Intellectual Property Law Blog provides counsel in connection with copyrights, trademarks, patents, trade secrets, false advertising, licensing and promotions and sweepstakes. The blog’s objective is to serve as a forum to discuss IP strategies that provide protection to a business’ or persons’ intangible assets. Facebook fans 299. Twitter followers 12. Rome, Lazio About Blog Studio legale boutique DANDI avvocati di diritto d'autore - DANDI offre servizi di consulenza legale alle produzioni cinematografiche e audiovisive. Facebook fans 1,985. Twitter followers 290. CA About Blog James Yang is a patent attorney whose practice encompasses all area of intellectual law including patents, trademarks, copyrights and trade secrets. About Blog Trademarkology provides insight and guidance to help protect brand names, slogans, or logos with a federally registered trademark. Facebook fans 297. Twitter followers 1,118. Chicago About Blog ktMINE Blog shares the world's intellectual property information, including royalty rates, patents, license agreements, M&A, and trademarks for business intelligence. Facebook fans n/a. Twitter followers 1,887. Facebook fans 24. Twitter followers 563. About Blog Our business model is to cultivate lawyers who know all there is to know about intellectual property, whether it be special requirements under the America Invents Act (AIA), patenting chemical compositions and pharmaceuticals, current developments in software patenting, or combating “bad patents” in federal court litigation. Facebook fans 1,420,391. Twitter followers 970,896. Facebook fans n/a. Twitter followers 1,750. Rohtak, India About Blog A successful blog on Intellectual Property Law run by most renowned IPR Attorney | Reg. Patent Attorney Mr. Lokesh. Mr. Lokesh is a former freelance technical writer, successfully completed law and now He is providing services in various fields of law, that is, Intellectual Property Rights, Patent, Trademark & Copyright, Cyber Crime and drafting and vetting of various agreements and documents. Facebook fans 1,358. Twitter followers 12. London, UK About Blog Trademark Lawyer Magazine dedicated specifically to Trademark Law, part of the CTC Legal Media group. Facebook fans 1,025. Twitter followers 1,345. About Blog EPLAW was formed in 2001 as a non-profit making Association of experienced patent lawyers in the European community with the aim of promoting the equitable and efficacious handling of patent disputes across Europe. This blog gives information about the same. About Blog Vincent LoTempio is an author, his IP law blog is a robust resource for info regarding intellectual property law and other interesting stuff. Facebook fans 214. Twitter followers 1,471. Southern California About Blog Mandour & Associates, APC is a full service intellectual property law firm based in southern California. Facebook fans 101. Twitter followers 587. Melbourne, Australia About Blog A blog providing news and opinion on patents, technology and innovation. International intellectual property issues, from an Australian perspective. Facebook fans n/a. Twitter followers 2,408. About Blog IIPRD is a premier Intellectual Property Consulting and Commercialization/Licensing Firm with a diversified business practice providing services in the domain of Commercialization, Valuation, Licensing, Transfer of Technology and Due-Diligence of Intellectual Property Assets along with providing complete IP and Patent Analytics and Litigation Support Services to International Corporates. About Blog The Association of European Trade Mark Owners - represents trade mark owners' interest before the relevant EU and other international bodies in all relevant areas. Facebook fans 523. Twitter followers 1,460. Facebook fans n/a. Twitter followers 9,197. Kenya About Blog Strathmore University Centre for Intellectual Property and Information Technology Law (CIPIT). One of the research centres of the new Strathmore University Law School ready to help innovators and creators manage their intellecual property. Facebook fans 1,684. Twitter followers 2,024. New York City About Blog IP CloseUp is a leading source of insight for people who need to keep up with the business of intellectual property. Facebook fans 63. Twitter followers 1,191. About Blog "Where money issues meet IP rights". This weblog looks at financial issues for intellectual property rights: securitisation and collateral, IP valuation for acquisition and balance sheet purposes, tax and R&D breaks, film and product finance, calculating quantum of damages--anything that happens where IP meets money. 56. PHOSITA - Dunlap Codding | You get the idea. Oklahoma City, OK About Blog New ideas are the fuel of progress and the foundation of success. Dunlap Codding will help you protect your ideas so your business can thrive in any environment. Facebook fans 1,035. Twitter followers 377. Bridgeton, MO About Blog Kevin Haynie provides U.S. trademark services to help clients protect their brands, including trademark searches, registration, and infringement litigation. Facebook fans 208. Twitter followers 252. About Blog Welcome to the intellectual property blog by CHINABRAND CONSULTING. Follow us for the latest news in the area of intellectual property and other economical relevant topics in regard to China. CHINABRAND CONSULTING is a Master Service Provider specialized in intellectual property, holistic premium-quality market and competitor analysis, and advanced business development. About Blog IP Law Blog provides up-to-date information on patents, trademarks, copyrights, trade secrets, false advertising, & other IP matters. Facebook fans 816. Twitter followers 3,057. About Blog B2 IP Report covers intellectual property issues, especially those relevant to patent practitioners. The B2 IP Report includes posts from The Software IP Report and Claims Interpreted. Kent, TN23 3GN About Blog Patent Law analysis and news from industry experts. Global Reach, Local Knowledge by Patent Lawyer Magazine. Facebook fans 1,025. Twitter followers 2,970. Stanford, CA About Blog Lisa Larrimore Ouellette's Patent & IP Blog, Reviewing Recent Scholarship on Patent Law, IP Theory, and Innovation. Facebook fans 247. Twitter followers 3,986. Sunny San Diego About Blog Eric Lane is a patent and trademark attorney and the Principal at Green Patent Law in San Diego. Chicago About Blog R. David Donoghue is a patent trial attorney and partner with Holland & Knight’s Intellectual Property Group in Chicago. A trusted counselor to his retail and supply chain clients, Dave routinely speaks to groups of all sizes on an array of intellectual property topics. Facebook fans n/a. Twitter followers 2,844. About Blog Warren Woessner is Schwegman, Lundberg & Woessner, P.A., Minneapolis, MN, 1993 Present, Founding Partner. Emphasis in chemical, pharmaceutical and biotechnological patent prosecution, opinion work, licensing and client counseling. About Blog IP Intelligence is published by the BakerHostetler IP Law group and covers issues surrounding trademark and patent law. Facebook fans 415. Twitter followers 3,556. Worldwide About Blog IP Law Watch blog is all about Legal issues, law and regulations concerning the world of IP. Facebook fans 1,453. Twitter followers 5,653. About Blog Dr Michael Factor is a leading Israel Patent and Trademark Attorney regarding filing, prosecuting and enforcing patents, designs and trademarks in Israel. Indiana About Blog Indiana Intellectual Property Law News is a resource for attorneys and litigants with patent, trademark copyright, trade secret and related interests in Indiana and nationally. Facebook fans 8. Twitter followers 117. Asia About Blog King & Wood Mallesons are a leading law firm. As a leading international law firm headquartered in Asia, They help clients to open doors and unlock opportunities as they look to Asian markets to unleash their full potential. Facebook fans 9,809. Twitter followers 1,198. Portland, OR About Blog Articles about patent and prosecution issues at the United States Patent and Trademark Office regarding examiner behavior, rules and regulations, administrative law and responding to office action rejections. United States About Blog The Patent Professor® is the leading platform for advising, educating, and helping inventors nationwide in protecting their ideas. Founded and led by Professor John Rizvi, a Board Certified Patent Attorney with specialized industry experience having successfully completed over 1,200 patent cases over the past 20 years. Facebook fans 1,164. Twitter followers 155. University City, San Diego About Blog Ex parte PTAB Guiding Patent Prosecution. At Anticipat, we analyze and organize the issues and outcomes of the daily ex parte PTAB decisions, so you don’t have to. We provide specific appeal data and general appeal trends to help you become an informed and empowered patent prosecutor. Facebook fans n/a. Twitter followers 1,054. Dublin About Blog A&L Goodbody blog is about Dublin Lawyers & Attorneys for Intellectual Property, Communications & Information Technology Law in Ireland, U.S. & England. A&L Goodbody is an Irish law firm providing expert legal advice across every aspect of business law. About Blog African intellectual property law, practice and policies. This weblog provides news, information and comment on IP law, practice and business deals right across Africa. Facebook fans 1,778. Twitter followers 1,636. London, UK About Blog The discussion of news, cases, legislation and anything to do with Intellectual Property law, made accessible to everyone. Facebook fans n/a. Twitter followers 1,133. About Blog Intellectual Property Planet is a blog for brief intellectual property news from around the world. Facebook fans 3,883. Twitter followers n/a. Global About Blog Kluwer Trademark Blog is a publication of Kluwer Law International, providing information and news European Trademark law. About Blog This blog serves to guide in-house counsel and U.S. patent attorneys on navigating Chinese IP law. Perkins Coie was one of the first U.S. firms to enforce Chinese-invented U.S. patents against American defendants. Understand the ins and outs of China law and how it affects corporations. Facebook fans 1,396. Twitter followers 8,465. About Blog Knowledge Sharing Network & IP Resources. The Trusted Knowledge-Sharing Network Of Professionals Offering Guidance To Essential Online Learning Resources Related To The Protection Of Intellectual Property. Facebook fans 1,647. Twitter followers 3. Los Angeles, CA About Blog The Los Angeles Intellectual Property Law Association is the premier intellectual property law association in Southern California. Since 1934, LAIPLA has been educating and connecting members of the intellectual property legal community. Facebook fans 554. Twitter followers 405. Raleigh, NC | New York, NY About Blog Envision IP is a boutique law firm specializing in patent research. They provide patent holders, law firms, and patent buyers and investors with in-depth patent validity, valuation and transaction support services. Facebook fans 9,938. Twitter followers 754. Pittsburgh, PA About Blog IP Spotlight provides news and practice tips relating to the legal and business aspects of intellectual property and other intangible assets. Topics include licensing, due diligence, acquisition, compliance and risk management associated with patents, trademarks, copyrights and trade secrets. Facebook fans 78. Twitter followers 110. Manhattan, NY About Blog IP-PI-Blog.com is dedicated to keeping IP protection professionals informed of trends in global IP infringement investigations and enforcement. Our weekly post evaluates the latest in enforcement and investigative strategies. Schweiz About Blog Case Law of the Swiss Federal Patent Court. Swiss and European Patent Attorney, keeping a close eye on the Swiss Federal Patent Court (FPC), the European Patent Office (EPO) and IP matters in general. Facebook fans 12. Twitter followers 135. Singapore About Blog Intellectual property news and events, including patents and trade marks from Singapore, ASEAN and South-East Asia provided by Cantab IP. Facebook fans n/a. Twitter followers 1,491. Facebook fans 198. Twitter followers 103. Boston, MA About Blog New England Intellectual Property Blog is written by the patent lawyers at Proskauer Rose and offers updates on New England IP legal issues. Minneapolis MN About Blog A Blog Devoted to the Comparative Law and Economics of Patent Remedies. Facebook fans n/a. Twitter followers 528. Frankfurt on the Main, Germany About Blog Your Source For Intellectual Property News and Analysis. All About IP is written by the Mayer Brown Intellectual Property team and offers legal insights on IP law. Facebook fans 1,783. Twitter followers 60. About Blog InTraCoM Group is the most powerful partner of companies, when it comes to intellectual property rights (patents, utility models) and innovation management. As an experienced and worldwide leading service provider they focus on valuation of patents / utility models, patent families or entire corporate portfolios qualitatively and monetarily that means including value determination. Pittsburgh, PA About Blog Picadio Sneath Miller & Norton, P.C. (PSMN ®) Pittsburgh, Pennsylvania business litigation, intellectual property, insurance, environmental and energy law firm. Facebook fans 85. Twitter followers 502. Texas/ DFW Metroplex About Blog Eldredge Law Firm provides news and commentary on Intellectual Property Law issues. Facebook fans 21,302. Twitter followers 871. Beijing, People's Republic of China About Blog I am an expert in Chinese patent law, US patent attorney, trial lawyer, & former in-house counsel at Qualcomm & Red Hat. Facebook fans 73. Twitter followers 756. Latin America About Blog An intellectual property legal firm in Latin America with more than 10 years of experience supporting its international clients. Facebook fans 1,220. Twitter followers 737. Chennai About Blog A blog that discusses everything that you need to know about Indian Intellectual Property Law. Trademarks, Patents, Copyrights, Domain Names and Designs. Facebook fans 1,141. Twitter followers 174. Northwest Ohio About Blog A patent law blog providing thought-provoking commentary with a dash of irreverent humor. Facebook fans n/a. Twitter followers 866. Sweden About Blog AWA IP Blog deals with all kinds of IP issues – from interesting legal cases and new international IP legislation to information about international IP conferences and other IP events. The IP news is conveyed and commented on by employees at Awapatent. Facebook fans 432. Twitter followers 598. Oakland, CA About Blog IP Legal Forum blog is all about Intellectual Property, Copyrights, Trademarks and Trades. Facebook fans 182. Twitter followers 581. Melbourne, Australia About Blog Warwick A Rothnie is barrister practising mainly in intellectual property, trade practices, telecommunications and general commercial law in Australia. Florida About Blog The Florida Intellectual Property Law Blog is an online repository of useful information, practical advice, news, and commentary relating to patent, trademark, and copyright matters. About Blog A niche blog dedicated to the issues that arise when supplementary protection certificates (SPCs) extend patents beyond their normal life -- and to the respective positions of patent owners, investors, competitors and consumers. The blog also addresses wider issues that may be of interest or use to those involved in the extension of patent rights. 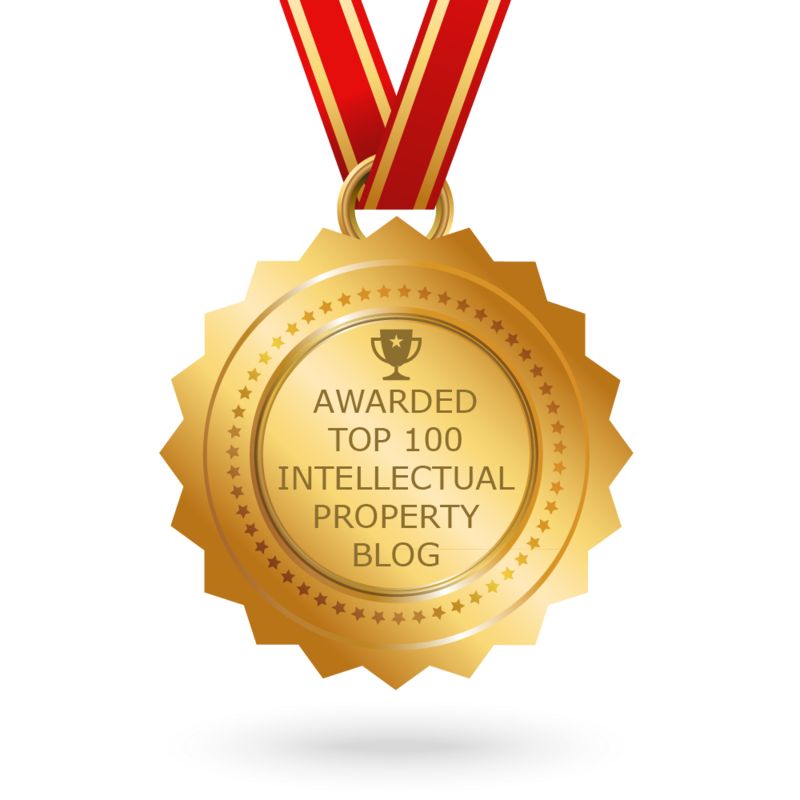 CONGRATULATIONS to every blogger that has made this Top Intellectual Property Blogs list! This is the most comprehensive list of best Intellectual Property blogs on the internet and I’m honoured to have you as part of this! I personally give you a high-five and want to thank you for your contribution to this world.